Home Wow Facts The invisible ink was invented today: What is Invisible Ink? The invisible ink was invented today: What is Invisible Ink? The history of invisible ink is mainly the history of war, for it is during such times that intrigue, espionage, and spying is at its most vital and necessary. In contrast to the billion-dollar-budgeted intelligence agencies of today, when America entered the First World War, the CIA did not exist, and the FBI was barely 15 years old. The Office of Naval Intelligence coordinated the gathering of the country’s intelligence. In a pamphlet included in the recently unclassified documents mentioned in the introduction, we can see that chemical inks were employed during this time, but basics like lemon juice and milk were still in use as well. While the Americans were falling back on old favorites, the Germans were at the leading edge of invisible ink development. At the beginning of the war, the Germans used inks made from headache and fever remedies and laxatives; these were handy as they could be passed off as common medicines. But when the Allies caught on, they were forced to develop inks outside those based on common household items. They utilized inks made from iron sulfate, copper sulfate, and cobalt salts, and employed reagents of sodium carbonate, ammonia fumes, and potassium ferroscyanide. Both sides worked to find a universal reagent that could develop every invisible ink, no matter its chemical composition. The Allies struck upon a solution when they discovered that iodine vapor would turn all invisible inks brown. It worked not by chemical reaction, but by revealing where the the paper’s fibers had been altered with moisture. But the Germans then came up with a simple counter-measure; after inscribing a secret message, they would wet the entire paper by steaming it, thus altering all of the paper’s fibers. After the paper was allowed to dry, it was sent on to its destination. During WWII both the Allies and the Axis powers worked hard on developing their own invisible inks and discovering the inks used by the enemy. This battle between laboratories became a veritable arms race, with each side trying to out do the other and come up with that holy grail of invisible inks: one that was odorless, could be developed by as few reagents as possible, and could not be exposed by heat, detected with iodine, or revealed by ultraviolet light. The Abwehr, Germany’s military intelligence agency, had five levels of inks, and gave the most complicated ones to its best agents (less trusted spies could have possibly been double-agents who would have turned the secrets over to the Allies). To develop one of the inks, the recipient had to moisten the paper, sprinkle it with a red powder containing naphthalene, heat it to 140 degrees Fahrenheit, and expose it to ultraviolet light. Another crafty ink required activation by blood–the agent pricked his finger and added a drop to the mix before writing. The Germans then counteracted this detection method by formulating an ink that required three applications of a reagent spaced three hours apart. During this Golden Age of Espionage, countries threw serious time and resources into developing spy tools and technology that would keep them steps ahead of the enemy. This included research into ever more effective and sophisticated invisible inks. One major advancement took the form of a new method of writing. The time-honored technique had been wet-writing; the person wrote directly with the ink on the paper. But this process had significant drawbacks. The agent had to steam the paper to prepare it, let it dry, write his message, re-steam the paper to remove the indentations made with the writing utensil, let it dry again, and then write a visible message to cover up the invisible one. And even after all this, traces of the writing could still be found by trained technicians on the other side. The Soviet KGB and East German Stasi developed an alternative during the 1950s: the dry transfer method. Instead of directly putting the ink on the paper, a chemically impregnated sheet of paper was placed between two sheets of ordinary writing paper. The secret message was written on the top sheet and transferred through the chemicals on the middle sheet to the bottom sheet. 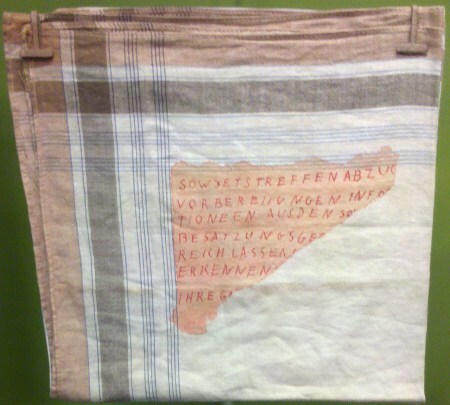 The top sheet was destroyed altogether (it was often made of a water soluble material that could be flushed away or dissolved in a cup of water), and the bottom sheet was left with an undetectable message. The chemical sheets could be re-used many times before they had to be discarded. This dry method was even utilized by American POWs during the Vietnam War to sneak secret information into their letters home. 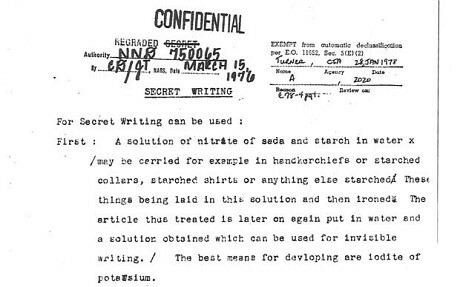 As the Cold War drew to a close, the number of chemists and physicists devoted to working on invisible ink was reduced, and the demise of snail mail and advancements in technology slowly rendered the use of invisible ink, if not obsolete, then a much less vital tool in a spy’s bag of tricks. But who knows? Perhaps when that “insurance salesman” you met at the airport offered you his handkerchief, you were really blowing your nose into the names of suspected terrorists.